9 Best Meal Subscription Boxes That’ll Make You a Chef! With their pre-portioned ingredients, easy recipes, and delivered-to-your-doorstep convenience, it’s no wonder that meal kit subscription boxes have become so popular. Whether you’re too busy to pencil in meal planning and grocery store trips, or you’re just a kitchen amateur eager to try cooking your own meals, these food subscription boxes are just the thing to keep you eating well all week long. But what’s the best dinner box for you? Choosing between so many different meal kits can feel as overwhelming as ordering off a huge chain-restaurant menu, so we’re sharing some of the most popular companies to help you narrow your search and get cookin’ in the kitchen! COUPON: Use this link to save $30 off of your first box! The Food: Restaurant-quality recipes with an eye towards nutrition. This weekly meal kit subscription sends you everything you need to make 2 to 6 healthy, tasty lunches or dinners per week for 2 to 6 people. Each new weekly menu is posted on their site (you can actually access entire recipes without having to sign up), along with details of each meal (what’s carb or calorie-conscious, which recipes are vegetarian, whether any potential allergens appear in the recipes, which recipes are staff or customer favorites, etc.). When you subscribe, Home Chef collects your preferences around what you do and don’t like to eat and matches you with meals from the weekly menu. Of course, you can also log in and pick your own meals, too. Special Diets: Home Chef does have vegetarian meals (though there are fewer options for vegetarians than meat-eaters on most weekly menus). According to their site, some of the vegetarian meals are, or can easily be made vegan, but not all. Can I Skip a Week? : Yep! You’re free to skip a week of deliveries or pause your subscription. Good to Know: Home Chef says they source the ingredients for their chef-created meals from the highest-quality food suppliers, though they don’t really message who those suppliers are. The Home Chef site website provides guidance on how best to dispose of their packaging, which is mostly recyclable, reusable, or non-toxic. Home Chef also offers add-ons, such as appetizers and sides that you can include with your box for an extra cost. Is Home Chef worth it for you? Read our Home Chef reviews to learn more about this meal subscription! The Cost: $12 per serving. Shipping is $6 for the 2 serving plan and free for the 3 or 4 serving plan. COUPON: Use this link to get your first Plated Night free with any subscription plan (up to $48 value)! The Food: Plated believes in food that’s “simple to make, delicious to eat, and fun to share.” Their seasonal recipes tend to be fresh interpretations of classic crowd-pleasers, but not so fresh that they’re alienating. Each weekly menu has about 12 recipes, as well as details on each recipe—whether it avoids gluten or carbs, if it’s high in protein, if it’s on the spicy side, if it’s stove-top specific, and more. When you sign up, you’ll set up preferences that will help Plated pick the right meals for you. If you’d rather dive in and do the picking yourself, you can do so via your account (or the Plated app). You can also choose add-on items, such as desserts, to include in your box at an extra cost. Special Diets: Plated does feature vegetarian options (though there are fewer options for vegetarians than meat-eaters on most weekly menus). Can I Skip a Week? : Yep! Modify your box or skip a week—just be sure to do so before noon local time six days prior to the scheduled delivery day. Good to Know: Plated is forward about their commitment to seasonal, sustainable eating. The “Food with Thought” section of the Plated site details their responsible approach to sourcing and shipping their ingredients and shares information on some of their vendors. Furthermore, they choose 100% sustainably sourced seafood, 100% antibiotic-free meats, beef with no added hormones, and produce that is fresh, seasonal, and hand-packed. They strive for local products whenever possible, but note that their ingredients aren’t 100% organic. Plated also prioritizes packaging with a lesser environmental impact, including jute insulation for their boxes. Is Plated worth it for you? Read our Plated reviews to find out. The Cost: $12.50 per meal (order more meals per week to save). Shipping is free! COUPON: Use this link to save 30% off of your first order! The Food: Unlike other meal kit subscriptions that require you to prepare the ingredients and cook the food, Freshly arrives ready to go—just pop it in the microwave, and in 2 minutes, you’ll be ready to eat. But unlike many prepared meals you find at the grocery store, these meals are fresh and fully focused on health. All of their products are gluten-free, high in protein, low in carbs, free of processed sugars, and packed with natural ingredients. When you sign up for Freshly, you’ll note your dietary preferences. Freshly will use that information, as well as whatever meals you chose for your initial order to pick subsequent meals you might like. You can go with what they suggest, or switch things up as you prefer. Also unlike other meal kits, this one even offers breakfast foods! Special Diets: Freshly does feature vegetarian options (though there are fewer options for vegetarians than meat-eaters). Can I Skip a Week? : Yep! Use the “Meal Planner” tool to adjust what you receive each week, including how many meals (if any at all), and what day you’d like to receive them. Good to Know: Freshly doesn’t offer a totally new menu each week, but that’s partially because their usual menu is so big. Instead, you’ll see a couple new items added or switched up per week. Freshly isn’t too forthcoming about where they source their ingredients, but they do take care to cut down on waste wherever they can. They use denim for their insulation, and portion meals in a way that eliminates food waste. Note that Freshly doesn’t serve all regions yet, though they are eager to expand. Is Freshly worth it for you? Read our Freshly reviews to find out more about this subscription box! The Cost: $9.99 per meal, or $8.74 per meal with their Family Plan. Shipping is free, though there are still some areas Hello Fresh doesn’t yet serve. COUPON: Use this link to save $40 off of your first box! The Food: Hello Fresh recipes are approachable and simple to make, but they usually include a unique ingredient or two that makes them feel special and fun. You can download some of their current recipe cards as .PDFs without even having to sign up! As the name suggests, their focus is delivering you tasty recipes and farm-fresh ingredients. Each week, Hello Fresh will use the preferences you provide to match you with new meals. You can either stick with those meals, or swap them out for other items on the menu. Hello Fresh notes a “Difficulty Level” for each of its recipes, along with ingredients and potential allergens, so you can pick meals that fit your taste and your comfort level in the kitchen. Special Diets: Hello Fresh does feature vegetarian options (though there are fewer options for vegetarians than meat-eaters on most of their weekly menus). Most of the vegetarian options can be made vegan, but not all. Can I Skip a Week? : Yep! Just hop on your Hello Fresh account (or their app) to manage your deliveries. Good to Know: Hello Fresh isn’t up front about where it sources its farm-fresh ingredients, but it does take care to package everything in neat recipe-specific boxes inside an insulated, ice-packed box. Some items are even packaged in a unique type of wool insulation for super-safe keeping! Is Hello Fresh worth it for you? Read our Hello Fresh reviews to learn more about this subscription! The Cost: $8.74 per serving plus free shipping. COUPON: Use this link to get 3 free meals with your first box! The Food: Wholesome, tasty recipes with gourmet twists that make each meal feel out-of-the-ordinary (but not too adventurous for pickier eaters). Set your preferences when you sign up, and Blue Apron will match you with meals to fit. Along with the pre-portioned ingredients and recipe cards, Blue Apron includes the story behind the food in the box (and video content, too). Like most other boxes, you can log in to your account and pick the meals you like most. Special Diets: Blue Apron does feature vegetarian options (though there are fewer options for vegetarians than meat-eaters on most of their weekly menus). According to their FAQ, most recipes can be tweaked to fit different dietary needs with a few at-home adjustments. Can I Skip a Week? : Yes! Log in to your account to change up your deliveries. Good to Know: Blue Apron is as serious about the well-being of our food systems as they are about making delicious recipes. The Blue Apron site features tons of information about their sustainable vision, which includes high standards for meat, seafood, and produce, non-GMO policies, encouraging eating seasonal produce, and eliminating food waste. They also have a “Suppliers” section highlighting recent vendors. Blue Apron packages most of their items in recyclable materials. Recycle them yourself, or use the company’s recycling program for subscribers—just send your materials back to Blue Apron and they’ll take it from there! Is Blue Apron worth it for you? Read our Blue Apron reviews to learn more about this meal subscription box! The Cost: $10.49-$14.99 per meal, depending on the dietary plan you choose, plus $9.00 shipping. COUPON: Use this link to get 2 free meals! The Food: Healthy, wholesome, meals with loads of veggies to keep you satisfied and feeling fab. Think fresh takes on favorites and playful dips into international cuisines. Green Chef will match you up with new recipes each week, but you can also pick for yourself. Special Diets: This is where Green Chef really shines. This box has multiple dietary plans to pick from: Omnivore, Carnivore, Vegetarian, Vegan, Gluten-Free, and even Paleo! There aren’t a ton of options per each plan per week, but just having these specially curated options is awesome! Good to Know: Green Chef lives up to its name in every way it can, from using biodegradable or recyclable materials in their packaging to using smaller, organic suppliers. Green Chef is a USDA-certified organic meal kit company, plus they’re a carbon-neutral company that offsets 100% of their carbon emissions with help from an organization called TerraPass. Best of all, they provide a lot of transparent information about all of these initiatives on their site! Is Green Chef worth it for you? Read our Green Chef reviews to learn more about this meal subscription! The Cost: $11.33 per plate (plans with more meals are a bit less expensive per plate) plus free shipping. COUPON: Use coupon code PURPLE20 to save $20 off of your first box! The Food: Other subscriptions have special diet plans—Purple Carrot is a special diet! This meal kit features 100% plant-based foods, meaning it’s totally vegan and totally healthy. These aren’t overly processed fake meats, either. Purple Carrot meals are filling, veggie-filled dishes with a mix of familiar flavors and tasty new surprises (think BBQ jackfruit in lieu of pulled pork). Special Diets: As mentioned, this is a totally vegan box, but these healthful, filling recipes promise to satisfy all sorts of appetites. Can I Skip a Week? : Yep! If you’re not a fan of a week’s menu, just skip it via your account! Good to Know: Ever heard of a guy named… Tom Brady? Turns out this famous NFL quarterback is a big fan of a plant-based diet and currently has his own protein-packed TB Performance Meals for Purple Carrot! It’s designed especially for athletes and other active types who need more protein in their diet. Eating plant-based meals is already kinder to the earth and its resources, but Purple Carrot also does what it can to eliminate food waste and offer tips for handling their biodegradable, compostable, reusable, and recyclable packing material. Is Purple Carrot worth it for you? Read our Purple Carrot reviews to learn more about this meal subscription! The Cost: Starts at $9.99 per serving plus free shipping for orders over $62.99. 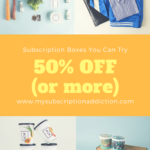 COUPON: Use coupon code TKOFF50 to save 50% off of your first box! The Food: Familiar dishes and flavors made from fresh, clean ingredients. According to their site, Terra’s Kitchen features sustainable ingredients that are antibiotic- and hormone-free, as well as non-GMO and organic, when possible. These dishes prioritize health (and great flavors! ), focusing on nutrient-dense produce and meats. When you sign up, you’ll choose from 50+ meals, as well as snacks, beverages, and other dishes. Unlike other meal kit subscriptions, Terra’s Kitchen pre-chops all of their ingredients (a big time-saver), and packages everything in a reusable cooling container. Return the container after you’re done with it so it can be used up to 100 times! Special Diets: Terra’s Kitchen has plenty of meals for vegetarian, gluten-free, and paleo eaters. When you sign up, you’ll be able to set preferences to make sure those foods show up first. Can I Skip a Week? : Yep! Use the site, or the Terra’s Kitchen app to manage your deliveries! Good to Know: If you’re hoping to lose weight through a healthier eating program, Terra’s Kitchen has you covered. They’ve partnered with a nutritionist to create their Real Weight Loss Plan, which guides you towards the best Terra’s Kitchen meals to keep your eating habits on track. The Cost: Meals start at $12.oo per serving plus free shipping. The more meals you order per week, the more you’ll save. The Food: Classic, effortlessly gourmet recipes—the kind of thing you’d expect from Martha Stewart, who helps curate the box! Browse the weekly recipes you love the most and pick which ones you’d like to receive each week via your account. You can expect lots of seasonal produce and perfectly portioned, responsibly sourced ingredients. Special Diets: Marley Spoon offers vegetarian versions of all of their subscription levels (though there are fewer options for vegetarians than meat-eaters on most of their weekly menus). Can I Skip a Week? : Yep! Manage your delivery frequency and recipe picks on your account. Good to Know: Marley Spoon doesn’t mention much about where they source their food, but they do say they strive to use local, small-batch products, and high-quality meats and seafood. The Marley Spoon website also provides information about recycling and reusing options for their packaging. Check out even more meal kit delivery subscription boxes (and discover coupons) in our directory!